The holiday season is coming up, and you know what that means. Compared to last year people are going to spend more money in the next few months shopping than they did the whole year. Outrageous deals and discounts are going to be the flavor of the day, and all players, big and small will collectively move hundreds of billions of dollars in merchandise, all the way till January. According to an eMarketer report, mobile ecommerce is booming in the US, thanks to the influx of tech savvy younger shoppers, and the size of the market is now worth more than $100 billion this year. The number of shoppers using mobile devices are also on the rise. A study by Criteo found that 25% of shoppers used a smartphone to buy in Q4 2016, up from 18% in Q4 2015. The study also found that the average order value of mobile commerce transactions increased from $91 to $98 on tablets, and from $74 to $79 on smartphones from the 2015 Q4 to 2016 Q4. 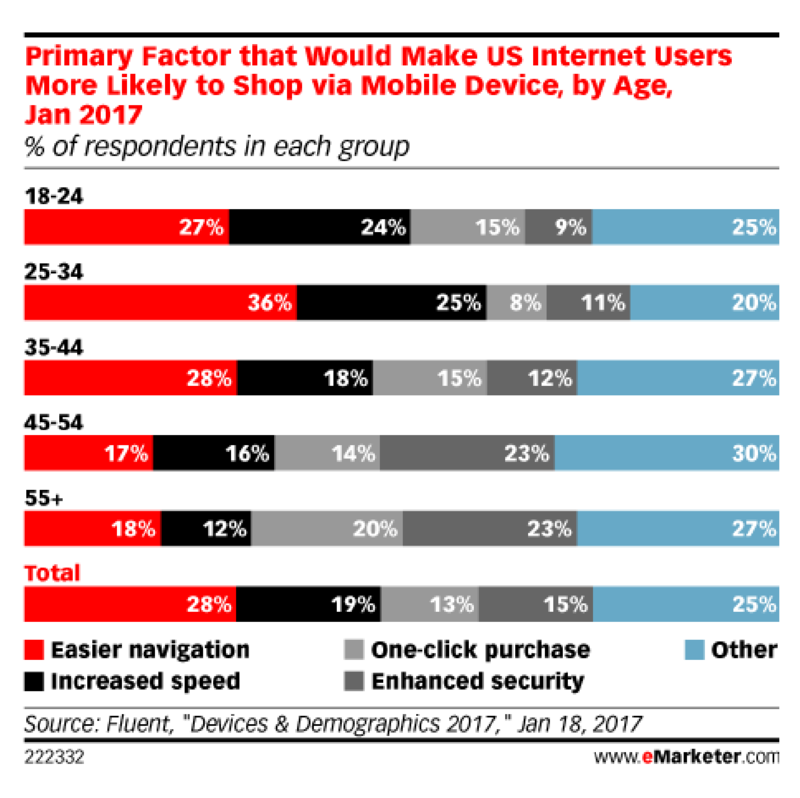 As the following graph shows, easier navigation scores the highest points for the core 18-44 age group when it comes to shopping via a mobile device. 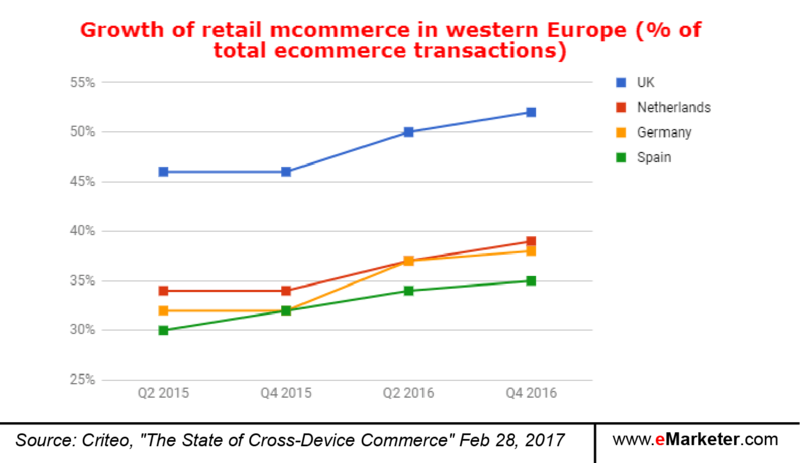 In terms of geographical distribution in Europe, UK clocked the highest percentage of shoppers on mobile, with 52% across all age groups. 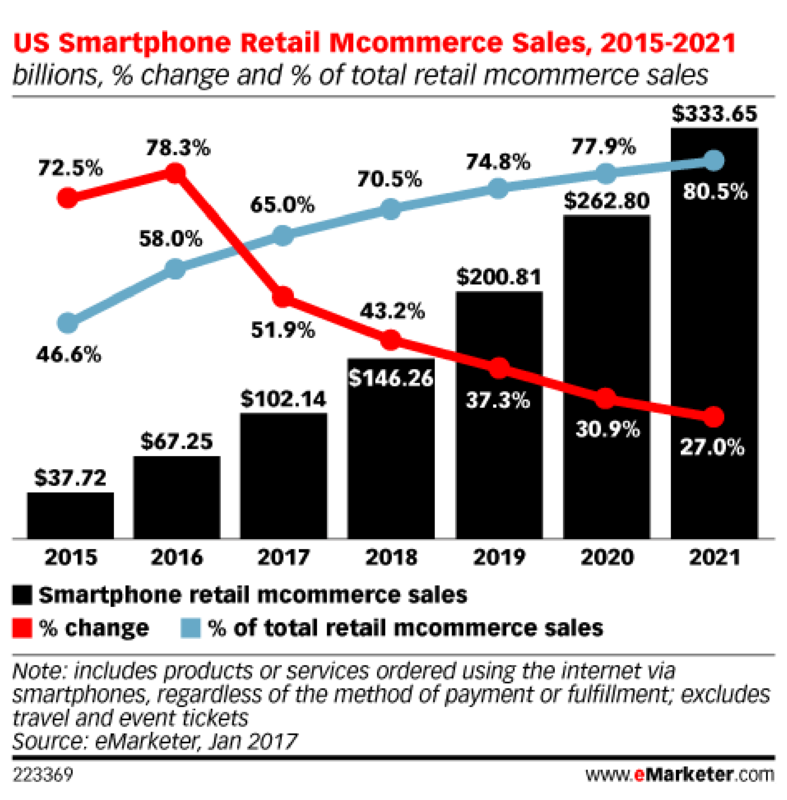 While these stats are indicative of the popularity of m-commerce, they don’t really help you as a marketer to take advantage of the trend. 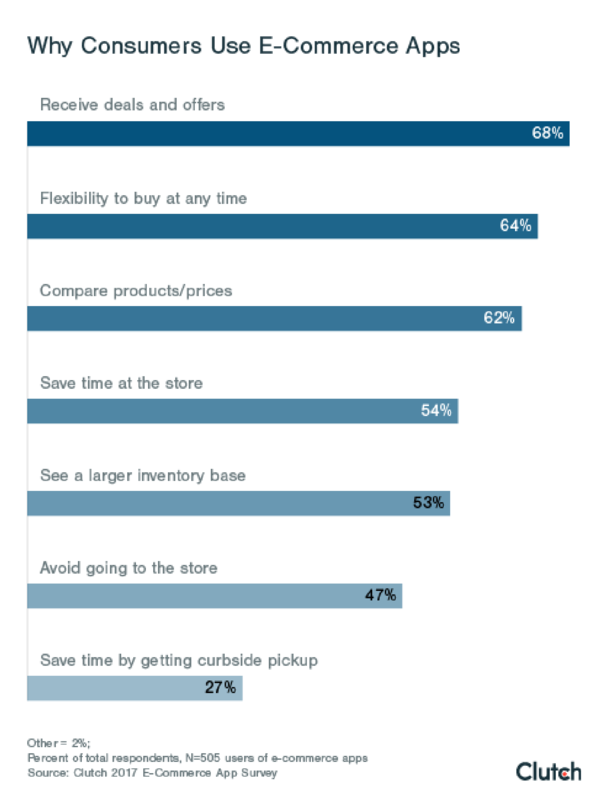 This graph, from a Clutch study about what customers want in mobile ecommerce apps has the answers. If you want more engagement and retention you know what app features to focus on now. It’s interesting how most of the frequently used features are related to personalization, because that’s what most customers expect when they use a mobile app. And sadly, most mobile ecommerce apps disappoint. Shopping and ecommerce apps are the fourth most deleted apps, after health, productivity and AI apps. Ecommerce apps also figure in #4 in the list of least used apps. Once an app is deleted, 62% of users rarely download it again. Retailers and e-commerce companies have to give people added incentive to use mobile apps over the mobile website, as 37% of users would be more likely to use the mobile website. Some of these incentives could be app only deals and discounts (always a big draw), unlocking of useful features (AR, voice search), or ease of navigation (saved data on forms). How can mobile apps help your ecommerce store? With mobile traffic outpacing desktop traffic, not having a presence on mobile can sound the death knell for your business. And while the jury is still out on the effectiveness of a mobile app vs. mobile optimized website, consider that user experience plays an important role in conversions. It’s well and good if you can guarantee the cheapest prices, widest collections, and fastest delivery. But that’s the Amazon model, and you are not going to be able to go up against Bezos. Instead, what if you deliver a standout user experience? What if the customer buying from your store can experience the product as if she was holding it in her hand instead of looking at the screen? What if the customer can search through your inventory with voice, instead of typing in long product descriptions? What if you offer the customer an option to chat live with a chatbot or with a customer service rep? All these, and more contribute to a pleasant user experience. And mobile apps can help you deliver them, and edge ahead of the competition. Without these options, you will be left defending your position on the basis of price or delivery options, and you can be easily edged out by a deeper pocketed competitor. So what can your mobile app do to get your more sales this holiday season? For today’s discerning customer who’s spoilt for choice, and who installs and uninstalls apps on a regular basis, here’s what you can do to get repeat customers to your ecommerce app. The biggest problem a lot of people have with buying products online is that the pictures don’t say the whole story. Apart from the price, there are many questions that a customer might have, like the size of the product, the ease of assembly, or the kind of setup needed to use the product. These answers, and more can be answered by videos. It doesn’t even have to be professionally shot, as long as the product is shown being used in a normal setting. Start off with videos on your highest selling products, and work your way down to other products. A study found out that videos makes customers 52% more confident about your product, and increased the time on site by spent by 88%, which translates into higher sales. If you are using Clevertap you can draw a clear relationship between the number of people watching the video and completed transactions, and then tweak your videos so that they deliver more conversions. As we have noted before, a vast majority of e-commerce apps are uninstalled immediately, or uninstalled after brief usage. This continued churn wreaks havoc on your bottom line, and makes it harder for you to break even. 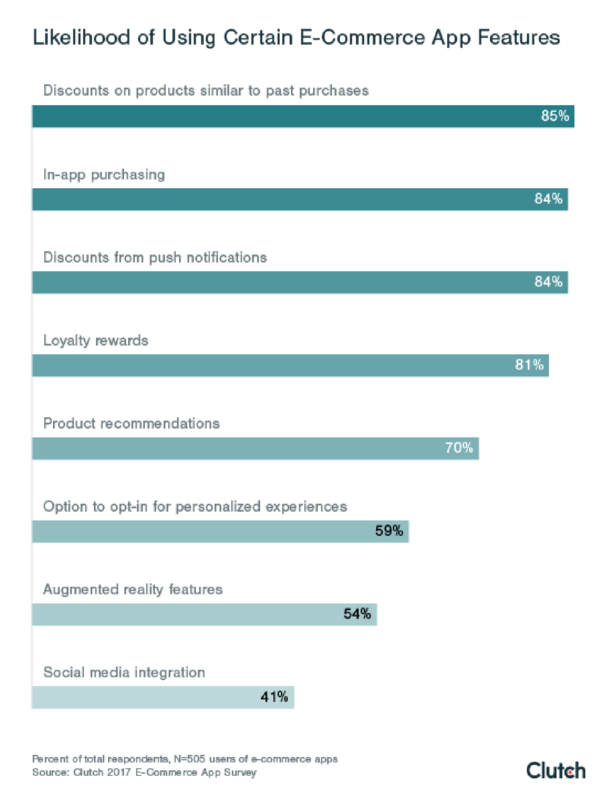 63% of respondents use their apps to access deals and discounts. 84% would opt for push notifications about discounts. 85% wants their discount notifications to be tailored to past purchases. So you should offer deals and discounts. However, there are some obvious downsides of a discount driven strategy. Firstly, it’s not sustainable in the long run, and makes it harder for you to be profitable. Secondly, and more importantly, it doesn’t generate any loyalty among users because there’s nothing to stop them from price shopping. Instead, be more strategic about discounts. For instance, offer discounts only at the end of the month or end of the quarter. Or, offer discounts to decrease cart abandonment rates. And then, there’s the trusty cashback, where the user gets a specific amount of credit that can be adjusted against future purchases or transactions. Unsolicited discounts will harm your brand. 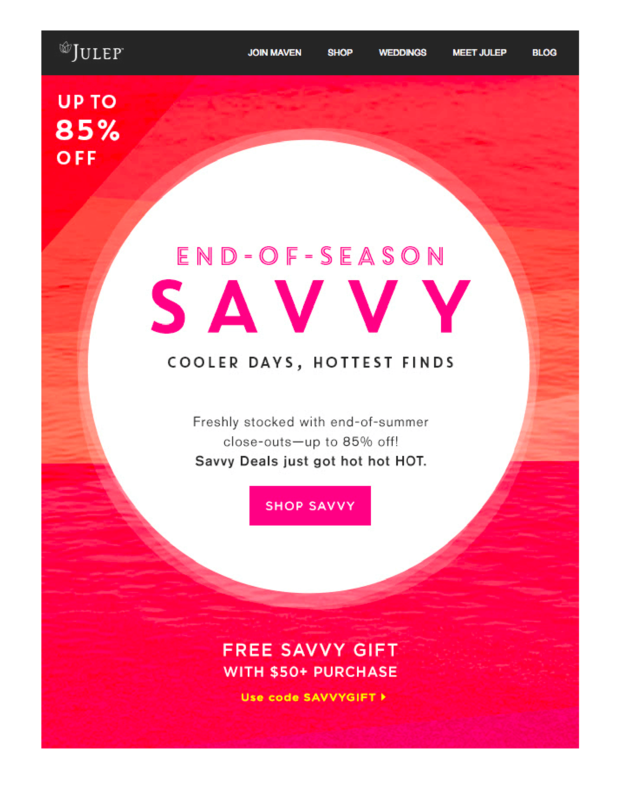 Make discounts contingent upon a specific user action, and earn customer loyalty. 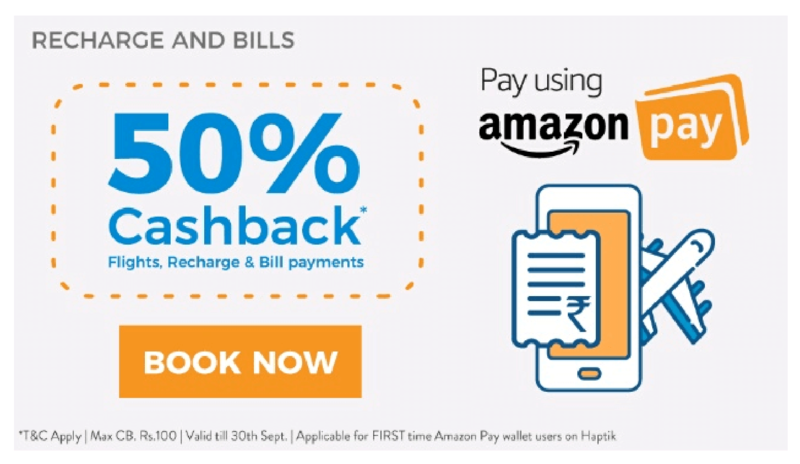 With Clevertap, you can automatically segment customers based on their in-app or on-site behavior and then send these coupons and offers, sometimes in real time. 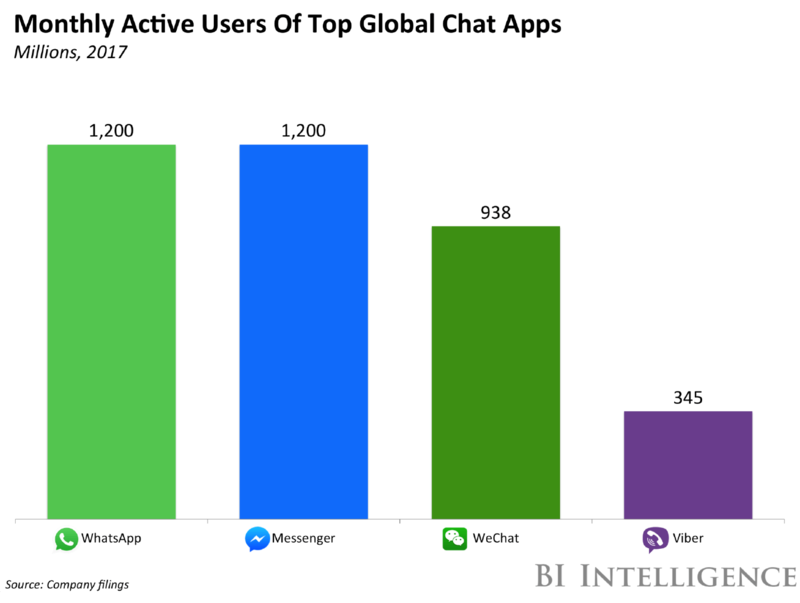 E-commerce stores now have 1.2 billion reasons to deploy Facebook Messenger chatbots in conversational commerce. And there’s another data point: according to a Smart Insights study visitors who use live chat convert at roughly 8x times the rate of non-chatting visitors. With Facebook opening up the Messenger platform to third party developers, people have been ordering pizzas, booking flight tickets, and using these bots for sales and service, especially on mobile. Massive brands like Starbucks, Whole Foods, Pizza Hut are already using chatbots to have more interactive and human-like conversations with customers without investing heavily in support agents. For example, check out the Starbucks order chatbot in action. This is one example of conversational commerce, where you text (or speak) and buy, instead of navigating through menus and pages, like on a desktop. Here, you can use this chatbot to book a skirt and set it up for delivery. You can also use chatbots to track your package, and get recommendations based on your purchase history. As AI matures, these bots will become more intelligent and human like and deliver a richer customer experience. …those who use the chatbot are nearly three times more likely to do so to ask questions on specific products versus browsing eBay’s inventory for inspiration and discovery – suggesting both engagement and retention are high. 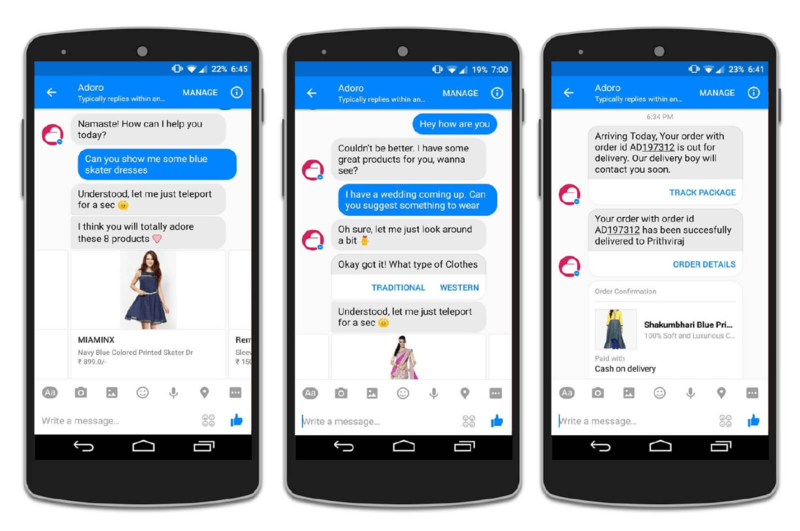 You can get started by using a platform like Chatfuel to start building a basic Facebook Messenger chatbot, and then move over to even more AI focused platforms like Niki.ai and Chatsuite to build robotic personal shopping assistants. Have you heard of Amazon Lex? Here’s a short video that explains what’s it about. The implications are legitimately mindblowing. Lex, which anyone can sign up for, will Alexa-ify your app or your store. As the video shows, you no longer even have to text, but simply speak to the app, and you will get a shoe (or a coffee, as in the Starbucks video) delivered to your home. 19% US customers have made a voice purchase so far through a digital voice assistant like Amazon Echo. 33% customers plan to do so next year. 24% US consumers own a voice controlled device, and 20% plan to purchase one next year. 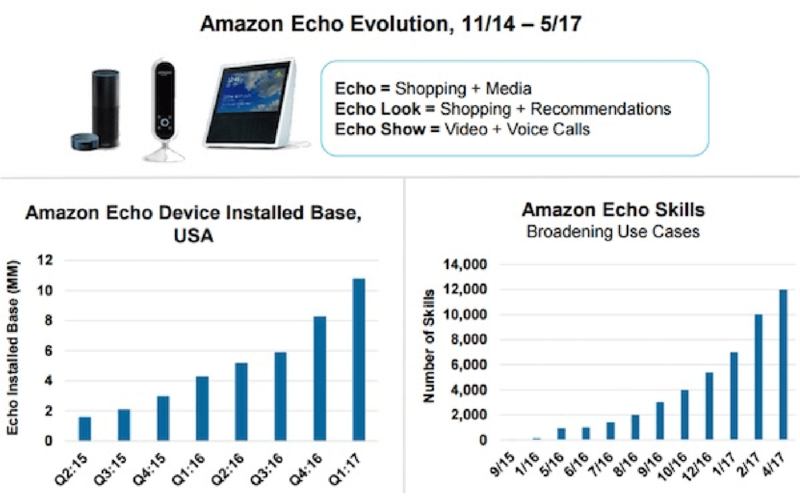 Data points from other sources also highlight the steady acceptance of voice based interaction among customers in the form of higher voice searches and a steady growth in Amazon Echo device sales and Alexa skills underscore the point. To make your content compatible with voice search, you will have to change the current content so that sounds like natural speech. Many retailers are using platforms powered by AI and NLP like Reflektion, Inbenta, and Klevu to pull this off. And there are some encouraging results: sports retailer Altitude Sports incorporated voice search technology from SearchSpring and saw a bump of 50% in revenue. Don’t you hate it when the couch that you bought online doesn’t look like the color in the photos, or worse, won’t fit into your room? IKEA now has an answer to that and other niggling questions, with its new AR app. Thanks to the recently released ARKit for iOS 11 and ARCore SDK for Android, it’s increasingly easier for app publishers to incorporate advanced AR features into their apps and roll them out to hundreds of millions of users. And while the technology is cool, for at least one retailer AR is already driving higher conversions. Apollo Box, which is an online marketplace for lifestyle products and has 1200 products from 450 vendors saw AR driving 8.5% of sales and a 25% boost in conversion rates. AR can help your customers visualize their purchases, improve and personalize the shopping experience. By the time you read this post you will be in the middle of the holiday season and might want to hold back on implementation while you are putting out fires and taking care of the immediate issues. But here’s the thing: if you continue with the same old approach, you will be swallowed alive and chewed out by the Amazons of the world. Do the comparatively easy things first. 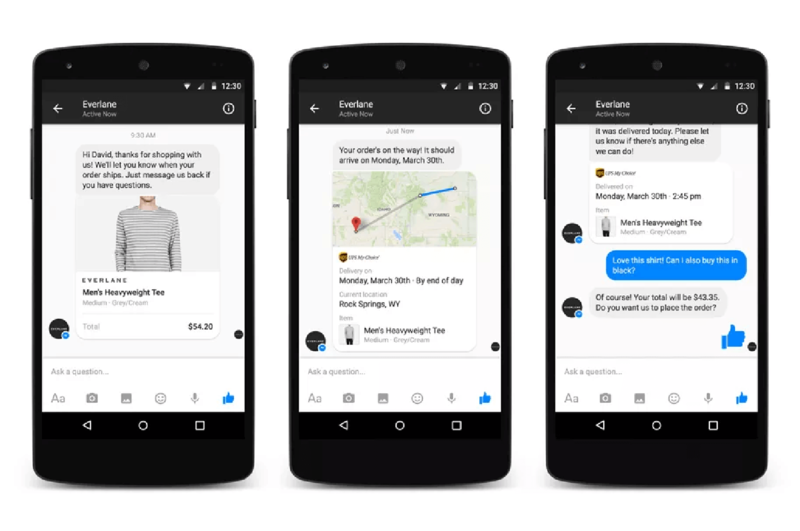 Add tutorial or demo videos to product pages, or implement a Facebook Messenger chatbot and get your customers to chat with you. Use analytics to build a customized profile for every customer, and then communicate with them over multiple channels based on their preference. (Clevertap is designed for both these tasks). In 2018 and beyond, the key to ecommerce success will hinge on your ability to keep customers loyal. These 5 tactics will help you do just that. Want to get your app to the top during this holiday season? Take a look at these 10 tips and strategies top apps are using.